Born of the voices of past lives and baptized in the dust bowl dirt, the Gothic Americana music of the HEATHEN APOSTLES harkens back to a bygone chapter of American history. Using contrasting influences such as 16 Horsepower, Nick Cave & the Bad Seeds and Siouxsie & the Banshees with Bill Monroe, Loretta Lynn (the band covers her classic Fist City) and Memphis Minnie, the HEATHEN APOSTLES have created a style of music that at once conjurs both angels and demons, and will enlighten a darkened soul. Crossing paths at a gathering one Indian summer evening, femme fatale bellower Mather Louth (Radio Noir) and punk rock n roll veteran Chopper Franklin (The Cramps, Nick Curran & the Lowlifes) quickly uncovered a mutual appreciation for murder balladry, Americana, and memento mori. It was not long before a collaboration that sought to marry these interests in a sonic landscape, THE HEATHEN APOSTLES, surfaced. The landscape was further tilled with the addition of Thomas Lorioux (The Kings of Nuthin’) on bass and Luis Mascaro on violin. 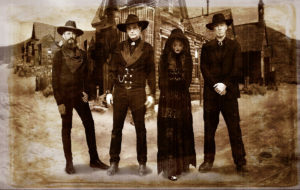 The constant output of songs and videos capture the essence of the Heathen Apostles modus operandi: Southern gothic imagery surrounded by haunting, minor-chord melodies, musical influences including Gothic, Bluegrass, Blues, and Gypsy Jazz, all deftly bound together by the band’s dark and sometimes brooding sense of a bygone age. Their discography currently contains three albums, four EPs and four singles, all out on Ratchet Blade Records and produced by Chopper Franklin.